This review originally appeared in the September 2000 issue (#145) of The New York Review of Science Fiction. 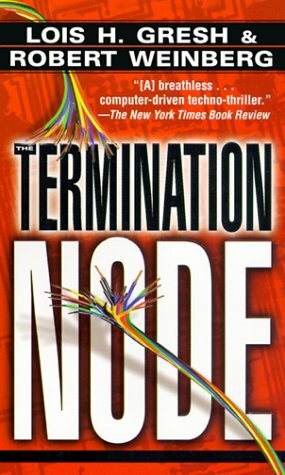 Like many thrillers, The Termination Node wastes no time in getting the action moving. Just about a decade in the future, the novel’s protagonist, superhacker and computer specialist Judy Carmody, is working an overnighter at Laguna Savings Bank. In the middle of what should be a routine operation, a hacker breaks into the bank’s network and starts rewriting account balances all over the system. Nothing Judy does seems to have any impact on the hacker; his commands are moving faster than she can react to stop or divert them. Yet, when the whole scenario completely plays out, all the account balances are returned to the original states.